The new treatment of eyelash extensions has taken the beauty world by storm… and it can totally change your appearance - quickly and easily. With semi-permanent eyelash extensions, you can transform the way you look with stunning effect. Already a cult hit, this revolutionary treatment allows you to throw away your mascara and experience longer, thicker sumptuous lashes 24 hours a day! Having performed 100's of sets of eyelash extension treatments, you can trust Beach Brown Beauty to give you the perfect look. More than that, your lashes will be tailored to suit your eyes, face shape and of course, your personal preference. The process involves attaching single strands of high quality synthetic lashes, one by one, onto your own natural lashes to mimic, enhance, and "extend" your own natural lashes. A variety of extensions are applied to add volume, length and curl. We are asked a lot of questions about eyelash extensions, so we've cherry-picked the most frequently asked and listed them here. If you cannot find your answer on this page, please feel free to call us on 0404 094 652. No. It is extremely relaxing with many clients falling asleep while having the lashes applied. Yes, they are completely safe when the application is undertaken by a trained professional. The bonding agent is extremely strong but does not touch your skin. The surrounding eye area is well protected so eliminating any potential eye or skin irritation. With a simple aftercare routine, up to 6 weeks. Your natural lashes regenerate every 60-90 days. We recommend a lash refill every 3 to 4 weeks to replace new growth so you can enjoy your lashes year round. For clients who would like to wear them long term, we recommend a fresh set every 3 months. How do eyelash extensions look and feel after the treatment? Eyelash extensions should look and feel like your natural lashes, and to the untrained eye no one can tell they are not your natural lashes. You should not feel any pain or discomfort in or around your eyes after the application. Lashes should be clean and well separated with no clumping or lumps of adhesive visible. Can I still wear make-up/eye make-up/mascara? Nothing changes when you have eyelash extensions. After the first 24 hours water-free, you can do everything from swimming, exercising, to wearing make-up. You won't need to wear mascara, however if you wish to on the odd occasion it is imperative that a non-waterproof mascara is used on the ends of the eyelashes. You can still wear eye make-up but it is important not to use any oil-based make-up, creams or removers as the properties in oil-based products will loosen the bonding agent. What can I use when cleansing my lashes? Use either a foaming cleanser or a non oil-based cleanser. Be extremely gentle when cleansing your lashes, use an upward motion only (do not cleanse the lashes sideways as this will tangle them). Avoid using face washers and towels near your lashes as they can catch and pull them out. No, because we are specialists, we use only the correct amount of glue and place them near the eyelash root. It is important that lashes are glued 1 – 2 millimetres away from the root. This ensures a healthy eyelash will continue to grow and the skin on the eyelid is kept clean. Can I have extensions applied to my bottom lashes? No, the technique of applying lash extensions to the bottom lashes requires the client to keep their eyes open. For safety reasons, we do not condone this practice. Can the extensions be removed easily? The extensions are applied in view of them staying up to 4-6 weeks therefore the removal process while easy for a professional should not be undertaken by an amateur. A product available to salons only is used and will remove the extensions easily and without damaging the natural lash. Will my eyelashes be shorter after having the extensions removed? They may appear shorter because you have become accustomed to looking at longer lashes. After a week without extensions they will appear as they were prior to the treatment. I always lose more lashes on one eye, why is that? This is usually because that is the side of the face you sleep on and during the night the lashes rub on pillows or blankets. I rub my eyes a lot will this be a problem? Yes, you cannot rub your eyes in a rough manner as you run the risk of pulling out the extensions and your natural lashes. Do I need to have my eyelash extensions removed on a regular basis? No, as long as you take care of your extensions and do not play with them or pull them out. Some clients have had their extensions on for years however for clients who would like to wear extensions long term, we ideally recommend a fresh set every 6 months. These are the most popular type of lashes and the best value for maximum effect. They are the strongest lashes and the most dramatic on the market today. If you have any further questions, or develop any symptoms that concern you post treatment, then please don't hesitate to call us! We want you to love your lashes, and are here to help. Beach Brown Beauty offers differing styles inspired by the most glamorous and iconic women in the world. Refills should be scheduled every 3 to 4 weeks after the initial application, and require 50% of the lash extensions to be remaining. Prior to your appointment please remove all eye makeup or mascara. If you wear contact lenses please bring your case and solution for storage during the treatment. Your lenses can be replaced immediately after your treatment. If the colour of your eyelashes is very fair and you wish to tint them, it is recommended you do so at least 72 hours before the extension treatment. 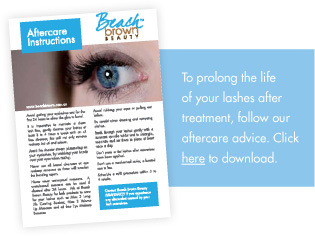 Eyelash curlers should not be used on the day of treatment! Perming must be completed 6 weeks prior to extensions being applied.